I sent out a ton of cards for TTMs last week. On February 18 I sent out 5 and on February 22 I sent out 16. I got my first two back today. I'll show the other tomorrow, hopefully. What I'm doing with the TTMs, for the most part, is take a bunch of old cards that are just sitting in boxes and re-purposing them into something else. I am getting ones signed that I think will look cool, and then putting them in albums. I rarely display cards in albums, but I think these will look really cool, especially with the assortment of sets and designs that I am using. I know I have used the word "re-purpose" quite a bit. I learned it from my good friend, Angela, when we were talking about the expanded "Rs" of recycling. You know, reduce, reuse, recycle, re-purpose. It fits right into my field of work, and I think it is something that will be kind of neat to do with my ever-evolving hobby. I have all but given up on getting baseballs signed, since it is so expensive to get them signed TTM, but I intend to still try a few here and there. I got this 1975 Topps in a huge deal a while back with my amazingly awesome friend, Max. I believe it was our first or second deal that landed me a bunch of album pages and a box of 1975 Topps baseball, and some advertising cards. 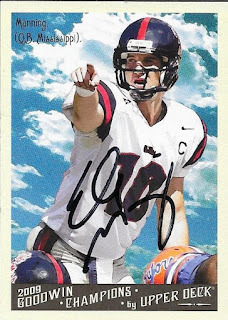 The cards have pretty much sat in my closet for a while, and when I got my Eli Manning card back signed, I figured I would start my next TTM project using those cards from Max. I sent to Gene Clines in the second batch of TTMs on February 22, and got it back today (Feb, 29). Clines (b. 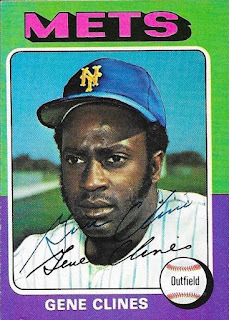 1946) played in the majors from 1970 to 1979 for the Pirates, Mets, Rangers and Cubs. 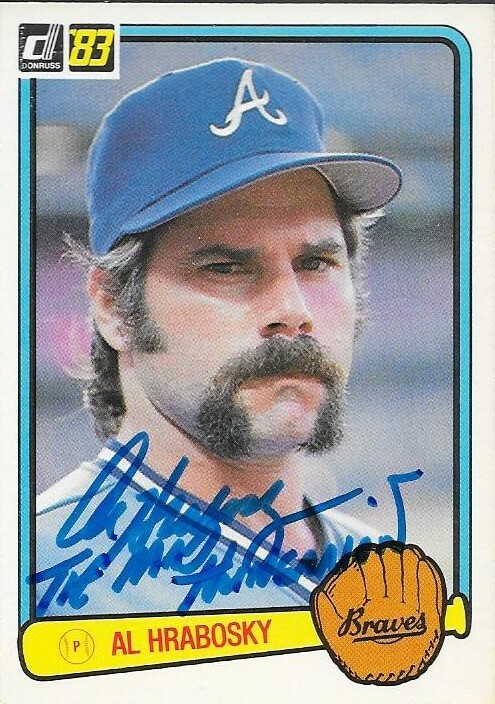 He had 645 hits, 5 home runs and a .277 lifetime batting average. He won the World Series with the Pirates in 1971 (booo) and finished at high as 20th in the NL MVP voting (1972). 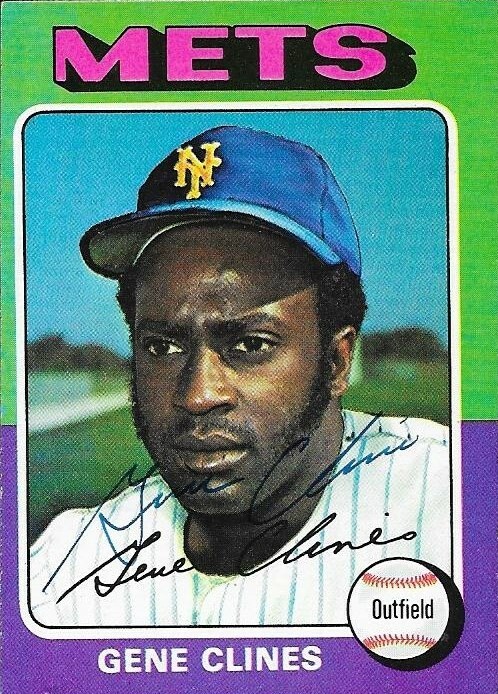 I sent Mr. Clines two cards (both 1975 Topps) and they came back signed with a 7-day TAT. Thank you Mr. Clines. I got a couple cards from my buddy, Ryu at the last two card shows that I have gone to. The above 2014 Topps Chrome sepia parallel Adam Jones was from the January show. I didn't get to talk to Ryu as much at that show as I would have liked, but he was very busy, and seemed to be pressed for time. I like the sepia parallels. I think, if they are in this year's chrome, they will look really nice with the borderless design. At the February show, I got to see Ryu for a big longer and he had this 2014 Heritage chrome of Nelson Cruz for me. He also had a few cards for my son, Chris, which was really nice. This Cruz is numbered 774/999. I was really happy to see Ryu, like always, at each show. He is a really good kid, and always fun to talk to. I wish we had more time to chat, but I understand. At the last show, I was able to sell him a nice Ichiro pin card from 2016 Topps. I hope it has a nice spot in his collection, because that card looked pretty cool. Thank you for the cards, Ryu! See you at the Easter show! I got a surprise email the other day from fellow blogger, JediJeff. He informed me that he had a few cards I needed for some sets, and that he wanted to send them my way. This was really awesome of him, and like I said, totally unexpected. Jeff included two cards I needed for my 2015 Stadium Club set, one of which is this angry-looking Albert Belle. I wouldn't go trick-or-treating at his house (look the story up), but man he could hit a baseball a long way. 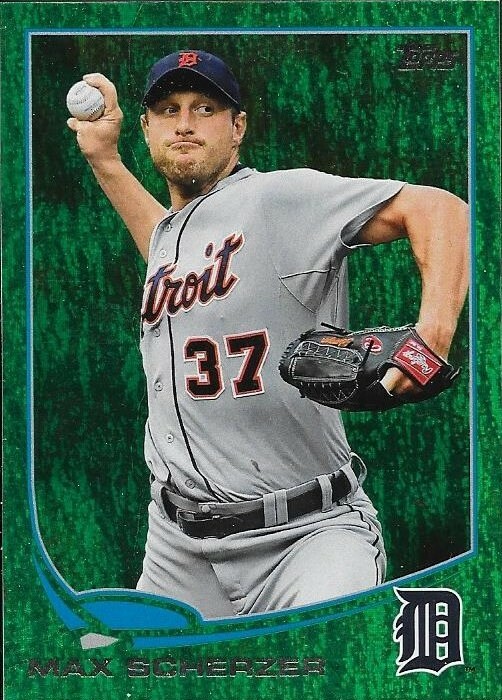 Jeff also included 6 2013 Topps emerald parallels for that set. I have added a couple here and there, but am still at a really slow pace on this set. I need to knock a bunch out via a big sportlots purchase, but I just haven't gotten around to it. Maybe sometime soon, I will hit this set a lot harder than I have been. Thank you so much for the care package, Jeff! I really appreciate it! Give his blog a follow, if you don't already. You can check it out here. I got my Christmas gift yesterday from my good friend, Andrew. He and I have been the best of friends for about 5 years now (wow, that's crazy). 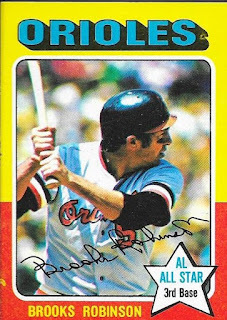 When we went to the National together last summer, Andrew was struggling to find something to get signed by Brooks Robinson. I had just seen an auction where someone had gotten a "5" billiard ball signed by him. I thought that was pretty genius. 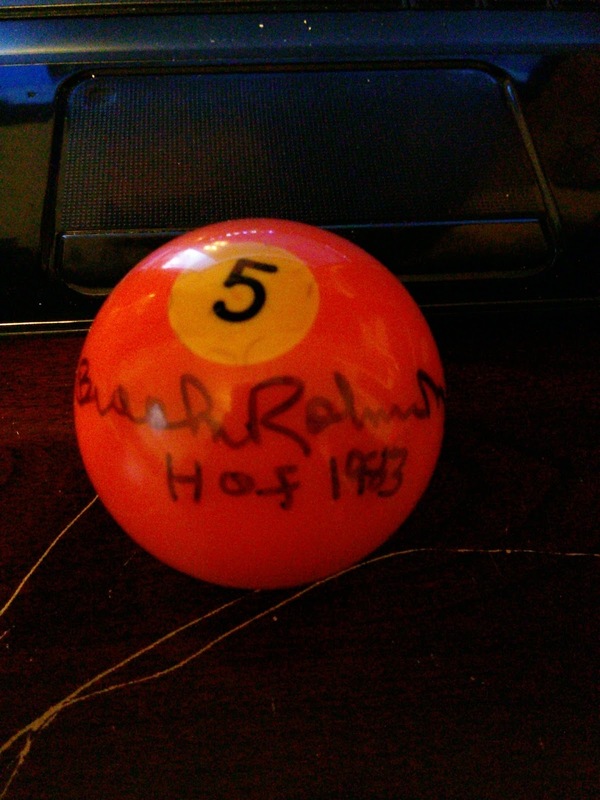 I mean, come on, the ball is orange and black (Orioles colors) and his number 5 is retired by the club. Pretty awesome, right? So, Andrew got his dad to let him sacrifice one of the family's pool balls, and Andrew got it signed by Brooks. Even Brooks thought it was a cool idea. I had no idea what to expect from Andrew for Christmas. I knew money was tight for him, but he always sends awesome stuff, and includes really heartfelt notes. When I opened this package, I had some tears come to my eyes, not only because the letter he wrote was really awesome, but also because I wasn't expecting him to give up this ball. Andrew is a really good friend. He is a great kid, who comes from an amazing family. I have had the pleasure of spending time with all of them the last two summers, and it is now something I look forward to each year. I have helped Andrew with his collection, sure, but I have also helped him with school and with life. I feel like he looks up to me, and my hope is that I act civil enough and hold my crazy inside long enough to be a positive role model for him. I have a lot of love for the guy. So, thank you so very much for the great Christmas gift, my friend. The letter you wrote was amazing, and your friendship is priceless. Thanks, Andrew! I don't have very many true 1/1s. 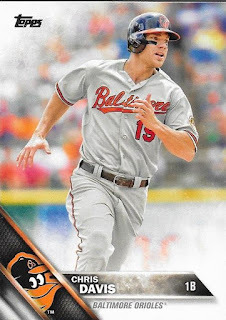 I have a platinum parallel of Chris Davis in my PC, and I have a 1/1 Virgil Trucks auto. I have some printing plates, but they really are out of, what, 4 or 5? You know, when you factor in that there are the different ones for each color used when printing a card. Well, I had something pop up on my Ebay feed last week that got my attention. This 2013 Topps Triple Threads Chris Davis wood 1/1 showed up and I was determined to not let it out of my sight. This was one of those cards that I knew if I let it pass, I would never see it again. So, I prepared myself to do whatever it took to be able to add it to the Davis collection. Luckily, I got it for much less than I originally anticipated, which was nice. 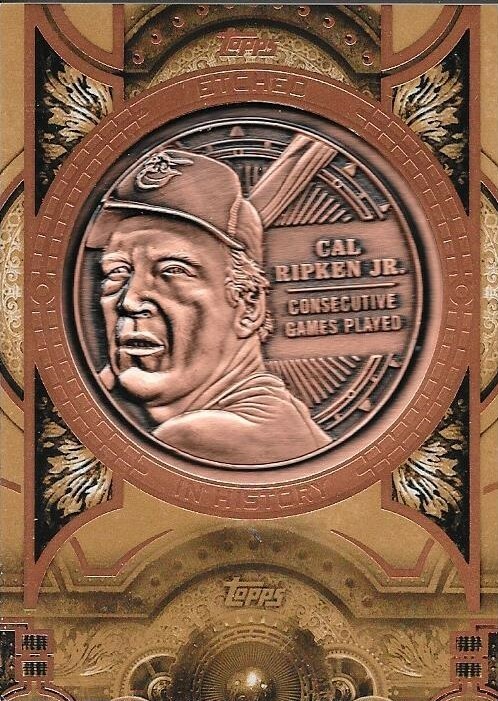 I have always wanted one of the wood parallels that Topps has been putting in Allen & Ginter. They aren't too crazy expensive, depending on the player, either. I just haven't been able to get a Davis. Funny thing is, I had just seen the wood 1/1 of Adam Jones on Instagram, and the guy who had it offered it to me, but I passed on it. I am really lucky that this Davis showed up just a couple days afterward! This is just an awesome card. 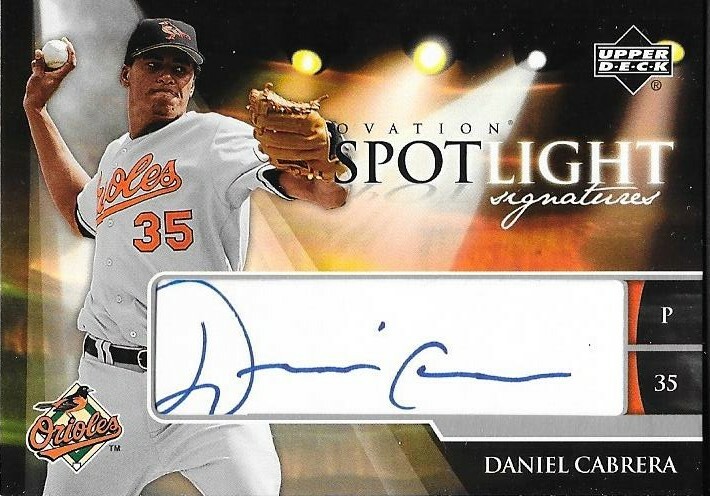 Not only is it a true 1/1, but it is autographed and it has a really nice O's patch on it as well. 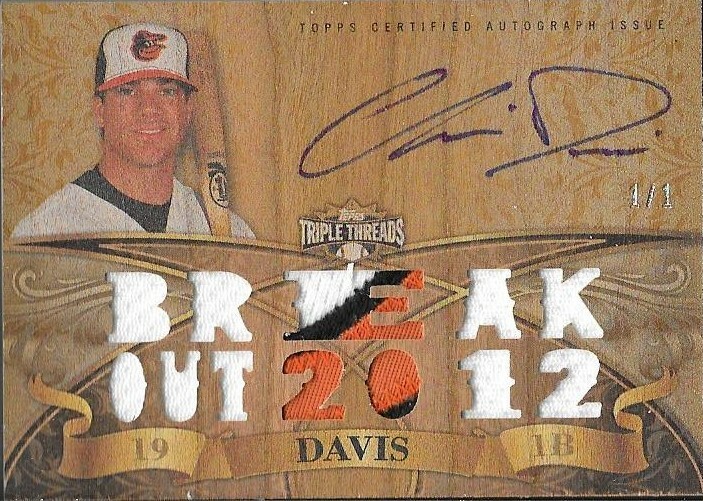 I think my Chris Davis collection is pretty amazing, if I do say so myself. It has taken a lot of work, but I am really happy with it. 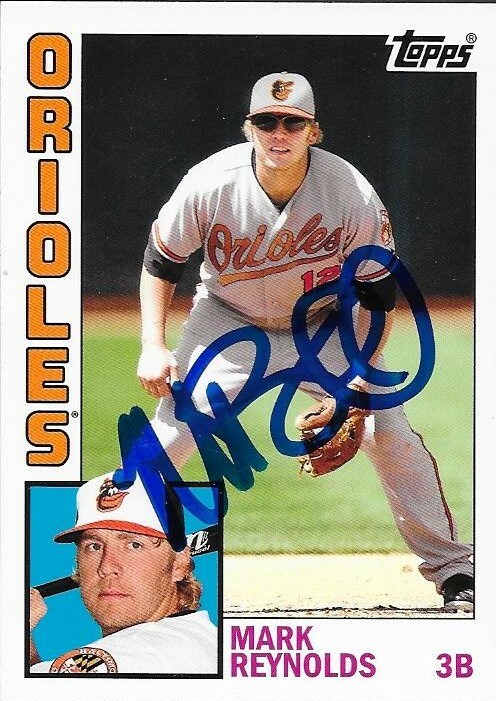 Thankfully, he re-signed with the Orioles, and I can watch him bash homers for them for a good while. I took yesterday off from blogging, and I could tell from the blog views! I was busy trying something semi-new for me, and we will see how it pans out. If it works, there will be plenty for me to blog about in the future. Basically, I stayed up til 1:30AM this morning researching people to send TTMs to, and dug for tons of cards to see if there was anything I could "repurpose". That carried over into today and tonight, so I wanted to make tonight's post a quick and easy one. 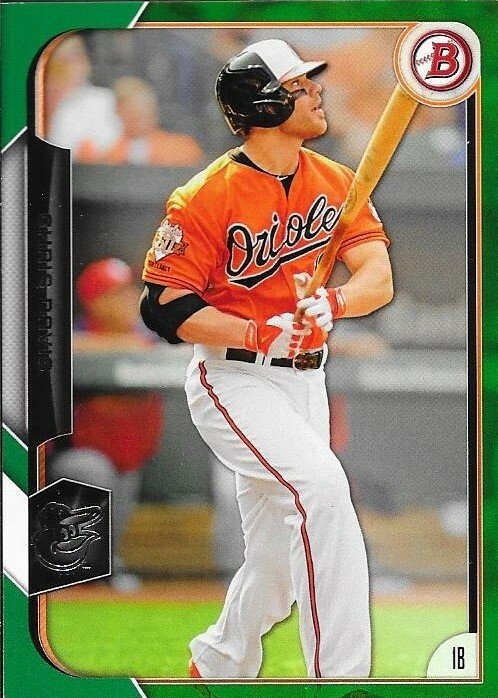 I got this 2015 Bowman Chris Davis green parallel off of Ebay after watching it for quite a while. I was buying something else at the time for a friend, and used this card to round my balance up. It is numbered 80/99 and scanned really nicely. 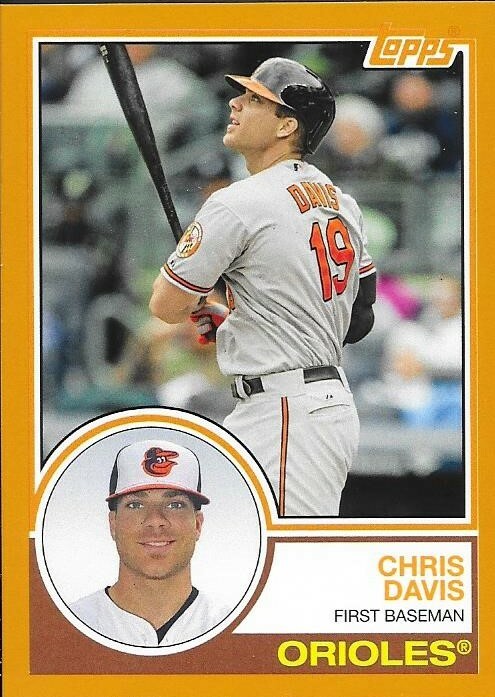 I was disappointed that there weren't as many parallels in the '15 Bowman set, and I was even more disappointed that Davis was left out of '15 Bowman Chrome. I don't think that will be a problem this year. My friend Michael has been raising money for whatever venture he is getting into these days. 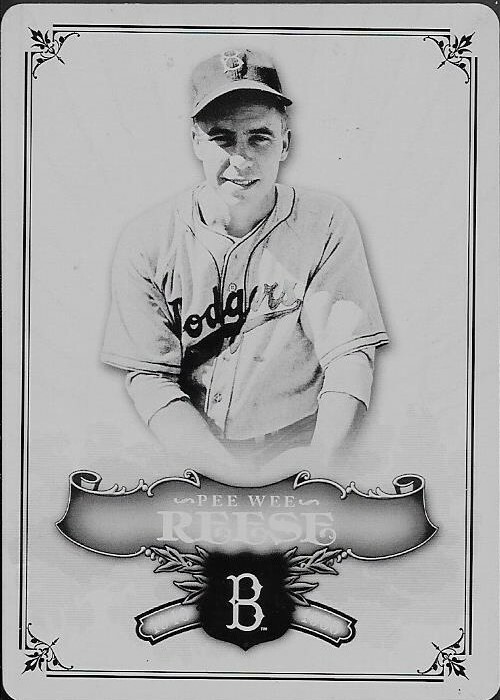 I'm not sure what type of card or memorabilia is intriguing him at this moment, but I was able to benefit from one of his sales recently when I picked up this 2006 UD Legendary Cuts Pee Wee Reese. He, as always, had a real good price on the card, and I wanted to help him out. I think Michael has kind of abandoned his Reese PC, which, I don't blame him. 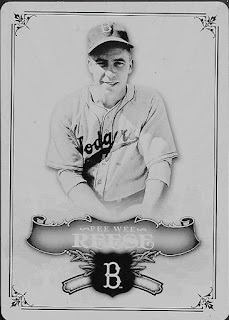 Not a lot of new stuff is being issued for Reese and a lot of his vintage stuff carries a premium since he was a Brooklyn Dodger. Still, I figured I would take this card since he is a Hall of Famer, and it is a printing plate. I might be able to flip it later on for something interesting. Thanks for the quick and easy deal, Michael! 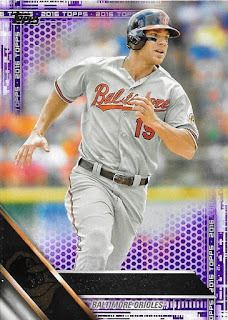 I picked up a new card for the Chris Davis PC recently, and I didn't have to spend a whole lot to get it. 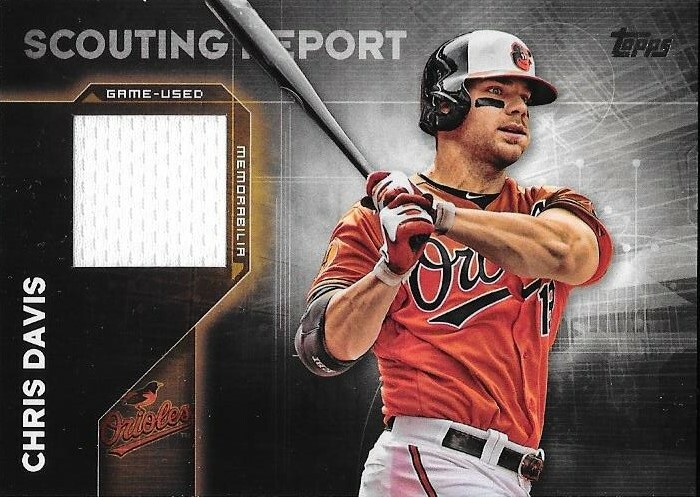 For $5.50 shipped, I got this Davis Scouting Report relic card. It isn't numbered, but still is pretty cool. I had hoped to pull one when I busted my boxes, but I wasn't lucky enough to get one. I was happy with what I pulled, though. I got a Verlander that I am sending to Noah, a Mauer that has gone to Patrick and a David Ortiz that will go to my buddy, Joey. Usually, I have one or two of the relics that I pull that end up going into the card show box, but this year I was able to find homes for all of them pretty quickly. I'm hoping to see one of these as a patch at some point, then I will surely be on one of them pretty fast. I'm glad that Davis ended up with a relic in this year's Topps. Maybe he will get an All Star relic in Update. If that's the case, then that will mean he had a pretty good summer! I'm not the best trader in the card community. That is something that I have come to accept in my years doing this hobby. Where I fail in that aspect, I feel like I make up for it in generosity and helping young folks build their collections. Ever since I helped out at the card shop in Winston-Salem, I have always done everything I could to help kids and teens add cards to their collections that they normally wouldn't have access to. The other part of that, that I enjoy, is how my helping people leads to new friendships. I made a friend on Instagram recently named Patrick, who hails from Minnesota and is naturally a Twins fan. He and I have chatted pretty much every day, and I have helped him find some nice vintage for his collection, and also made a couple care packages for him to add some Twins to his binders. He's a really nice guy, and seemingly enjoys the hobby as much, if not more than I do! 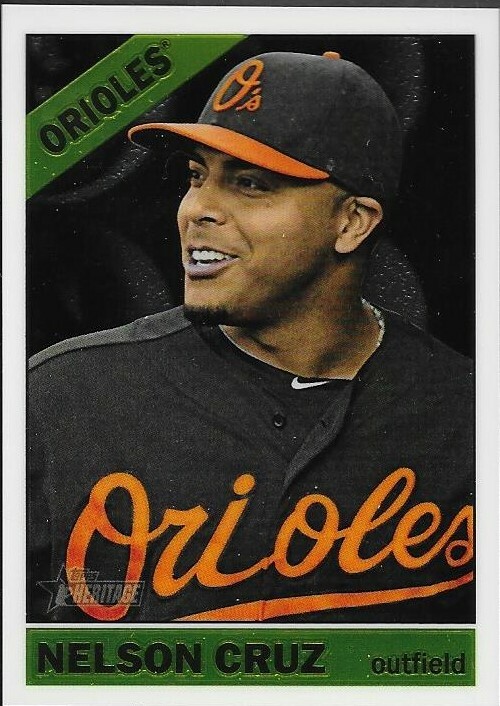 In response to the packages I sent him, Patrick went through his boxes of cards and his albums to find me some Orioles cards that he could send my way. Check out the Jose Canseco cameo on this card. I've seen hundreds of these and never noticed Jose on the card until today! Clearly, I don't send care packages out to people just to get stuff in return. I felt bad when Patrick messaged me and said that he didn't have a whole lot of Orioles cards, because I didn't want to deprive him of any of his cards. He sent me something anyway, which was really nice of him, and meant a lot to me. There were no relics, autos, or high end cards in the package. Patrick took from his collection because he felt it necessary to send a care package in return. That in itself carries much more meaning for me than any auto or relic ever could. He went out of his way to try to make me happy with a care package (and included a nice note), and that is all you can really ask for. Although there weren't any "glorious" cards in the package, the sheer thoughtfulness of Patrick is what I will take away from this. These cards that he sent mean a lot to me, and I hope he knows that. I know he appreciates me helping him add some nice stuff to his collection. I also know that when he is in the position I am in later on, he will go out of his way to help out someone who may be new to the community, or is trying to build their collection. I can tell that is how Patrick is. I'm glad I have been able to help him, and I sincerely appreciate him sending me this care package. I'm also very happy that I have a new friend that I can send care packages to! You all know that I don't collect football cards. So, when I found one in the boxes of cards that I got from Pete, I immediately wondered what I would do with it. I figured I would sell it, but since I was on Skype with my buddy, Max, he suggested that I take the card and try to get it signed TTM. The card, of course, is this Eli Manning from 2009 UD Goodwin Champions. I sent the card out on January 16, and got it back today (February 16) for a 1-month TAT. Not bad, since I sent it to the Giants stadium and Manning has been enjoying his off season. I'm really happy to add this to my TTM collection. It is another example of taking a card that normally wouldn't mean a lot to me and making it into something cool to talk about. I plan on digging through the boxes some more and sending off some additional TTMs. I can't wait to see which cards I am able to "re-purpose". I got a bunch of deals while at the show this past weekend, and added a few nice cards to my collection. I got the above 1975 Topps Mini Brooks Robinson for my PC. Thing is, I thought I had this already, but I can't seem to find it. So, for $5, I grabbed this one while walking around Sunday at the show. Right after I picked up the Brooks, I kept walking and checked out another table nearby. I saw that he had this Chance Sisco gold mini shimmer from 2015 Bowman. This one is numbered 20/50 and looks really cool. 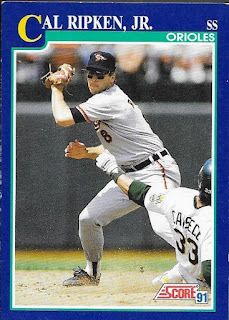 The vendor really needed to put his glasses on, though, because he kept telling me it was Christian Walker on the card. I didn't want to be rude, but I did correct him, because I felt like he was about to charge extra because it was Walker. I ended up getting this for $5, though. The vendor next to me had a nice box of recent stuff and parallels that I went through a little later when I was bored. I found a few cards for friends of mine, and this Adam Jones for myself. I had been tipped off by my friend, Tim. 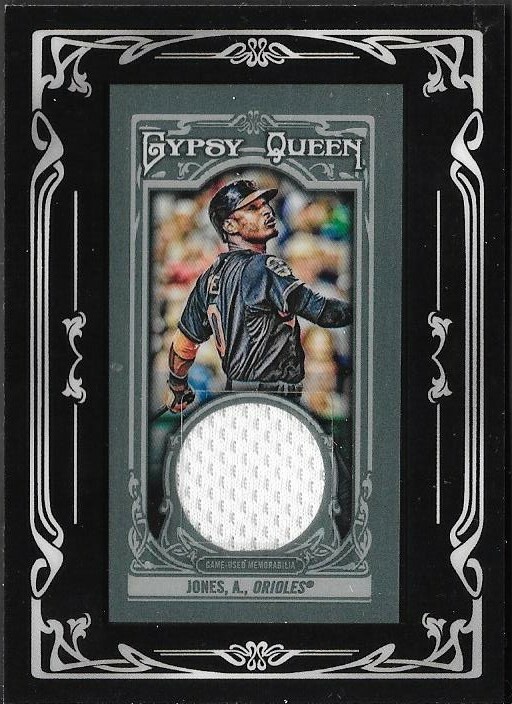 This Adam Jones black refractor from 2014 chrome is numbered 80/100. Finally, I got this card from Tim, himself. 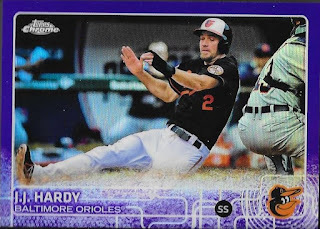 He had gone through a dime box and rescued this purple JJ Hardy for me. It is numbered 55/250. I feel like I did really well at this past show. I sold a decent amount of stuff, and have enough to carry over to the one day Easter show, if I'm able to attend that one. I also bought some nice stuff, but didn't break the bank. I wish I could say that for every show that I go to, though. Ok, I know I said yesterday that I was done buying cards at the show, but we all as collectors know that when we see something we have been looking for at a great price, we had better jump on it. 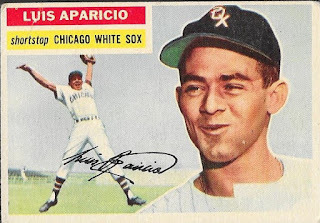 I was looking around today (I wish you all had come, because it sure was dead there today) and stopped by my favorite vendor, Kurt, and saw that he had two of the Aparicio rookies in his display case. He had this one, which is in really good shape, for $20. I had to do it. So, I have knocked off three cards from my Top Ten Wishlist so far this year, and we are only halfway through February. Not bad! I have been wanting this Aparicio for a long time, and now I have it. 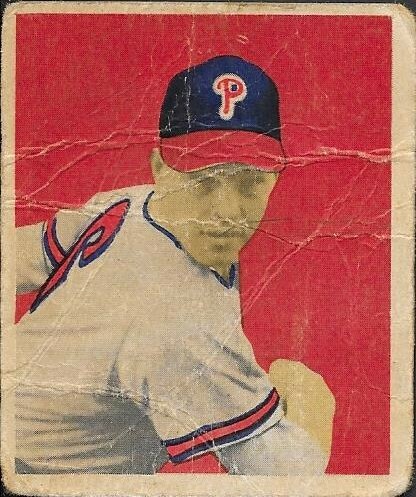 I have quite a few big names from 1956 Topps. I might have a decent shot at putting this set together at some point, and would definitely consider this one as my next 1950s set to do. So far, this has been a pretty decent card show, I have sold some stuff that I had been lugging around for a while, which is always nice, and so far, I have only bought one card for myself. I knocked a card off of my Top Ten Wishlist pretty easily today when I had gotten up to stretch my legs and saw that Mr. Dean from Dean's House of Cards (not to be confused with Deans Cards) had some albums of lower grade vintage at really good prices. I immediately saw his 1949 Bowman Robin Roberts, and while it had a nice price, I didn't have enough cash on me (on purpose so I wouldn't spend a lot), but when Mr. Dean said "I'll give you a better price on that." I had to see what he had in mind. The price he mentioned was JUST below what I had on me, and I figured that I should go ahead and take the deal, which would serve two purposes, I wouldn't spend anything else throughout the show (not a bad thing, mind you) and I wouldn't be tempted to get up and walk around. So, I picked this Roberts RC up to add to the collection, and I am really pleased. 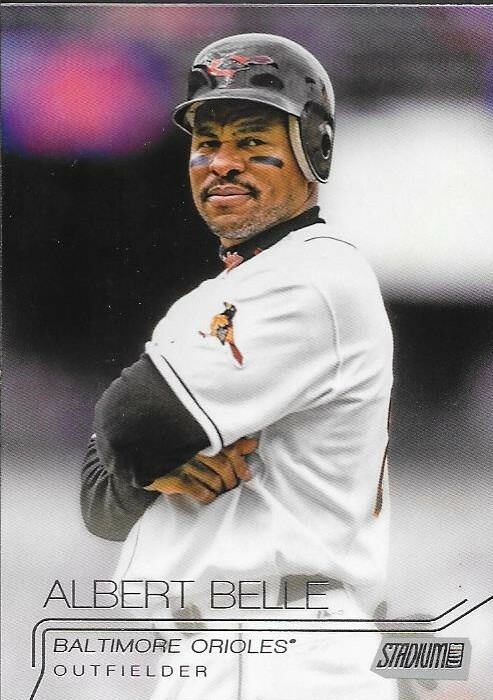 This is a rookie card of one of the more underrated Hall of Famers around. 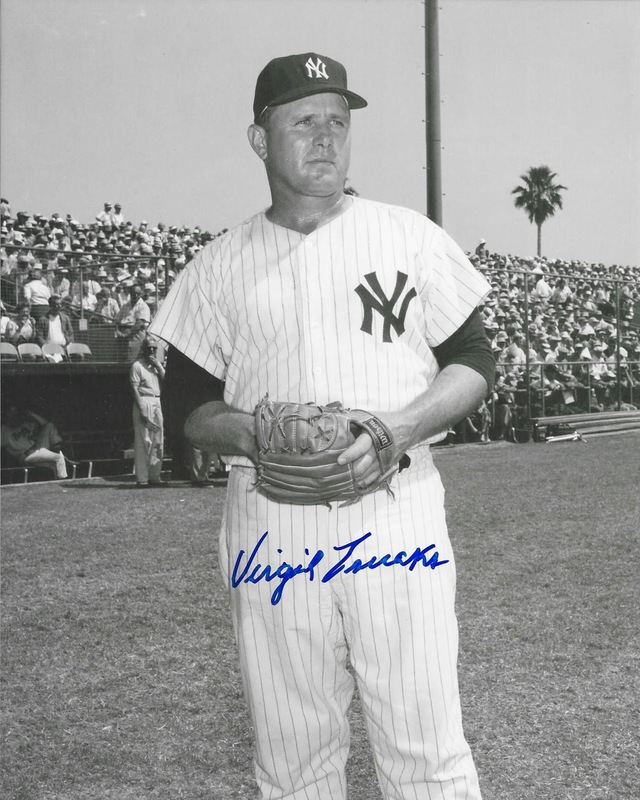 He was said to have been the best pitcher that Virgil Trucks saw pitch, so that carries a lot of weight with me. This is also a really cool-looking card. I love 1949 Bowman, and have a couple of them now. I have Trucks, of course, Bob Feller, Roberts and a couple others. The rookies in this set are really reasonable, so I might look to grab a few more in the future. Well, I'm back from the first day of this weekend's card show, and surprisingly, I did well. The weather kept a few folks at bay, but I sold a good bit of stuff that I have been lugging to shows for a few years now. That is always a good feeling. I have two days to go, and id they are as productive as today was, I'll be feeling really good! I came home tonight after stopping for dinner at O'Charley's in Cary to a one package mailday. In the package was this 2016 Topps Chris Davis purple parallel that I got for $3.00 off of EBay. I do like these parallels, and it is kind of cool that the parallels have spread beyond the border of the card, so to speak. It is just a cool look. This is a Toys R Us exclusive parallel, and in the past I have found them to be a little more difficult to obtain, so I pretty much grabbed the first reasonable one that I saw. I already have the base and the gold parallel, so I am now at work on the rainbow. Come to Raleigh and say hello this weekend. I am looking forward to lots of conversations about baseball and cards over the next two days. Actually, two trades were completed with Dugan, but who's counting? Certainly not me, because I had to message him and ask him what I even sent because I forgot. I also forgot that the main pieces I traded for were ones that immediately went to other people. However, I'm getting way ahead of myself. I met Dugan on Instagram a couple months ago, and it turns out, he is another collector from NC. He came to the last card show that I was at, and we chatted for quite a while. He's a pretty nice guy, and really easy to trade with. I sent him a couple chrome autos, and he hooked me up with a few cards, like I said, that went to other folks. He did, however, send me some extras in the form of a few rookie cards from 2015 Update. I got this nice Correa RC and a Bryant from update that I will topload and put in my RC box. I was hoping that Dugan would be at this weekend's show, but he is unfortunately not able to make it. Better luck next time. Thanks for the trades, Dugan. I got an awesome Christmas care package a few weeks ago from fellow blogger Judson (My Cardboard Habit). 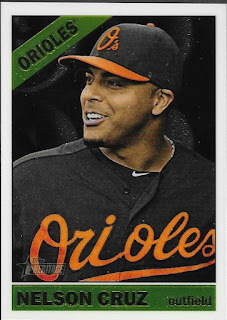 In the package was a bunch of really cool Orioles cards that I needed. 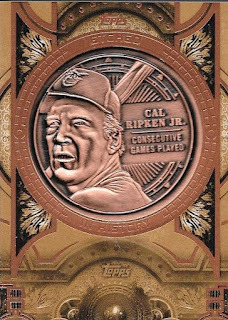 The above Cal Ripken coin card is really cool, and one that I hadn't seen before. It is a nice (and heavy) card that I can add to the Cal PC. Judson included two Christian Walker chrome autos, one of which is the above refractor numbered 92/499. This card itself is really nice in person. I'm not sure what will happen with Walker, but I still like him. This pink parallel of Delmon Young is a really cool addition. Take away the fact that Young has perennial anger issues and has made terrible life choices, his double in the 2014 playoffs will go down as one of the most memorable games I have ever attended. It appears that the double is depicted on this card, and I think that is really awesome. 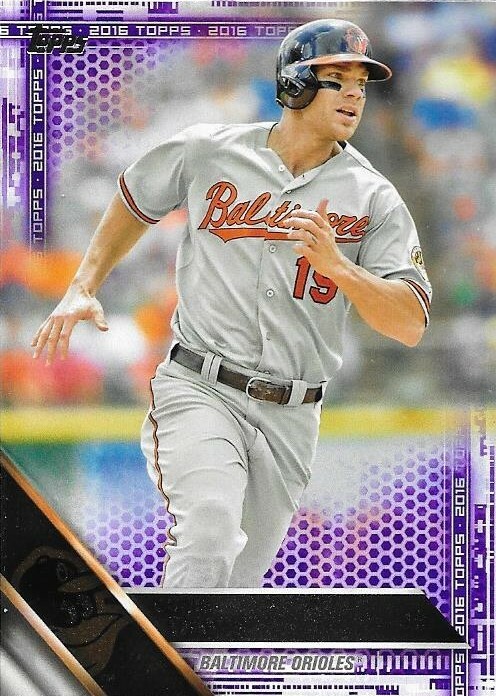 That make three cards that I know of that show photos from games I was at (the Mark Reynolds SP from a few years ago [2013 Topps, I think] and a Brian Roberts from 2006 Upper Deck). This card is numbered 19/50. Thanks for the package, Judson! I got a package in the mail a couple weeks ago from my friend and fellow blogger, Tim (from the blog - I Love The Smell of Cardboard in the Morning). 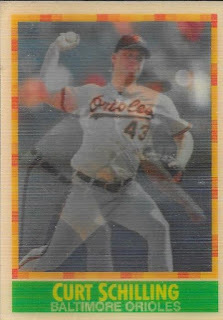 In it was a bunch of Orioles cards that I needed for various PCs. The above Chris Davis from 2015 Topps Archives is definitely one I needed and it numbered 2/50. 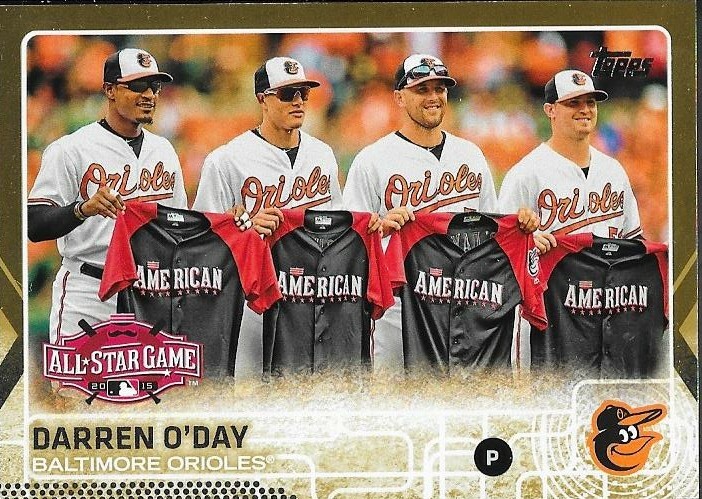 I really like this Darren O'Day gold from 201 Update. 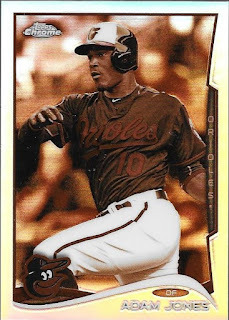 This might be one of my favorite shots on an Oriole card in all of the products that came out of 2015. O'Day was an unlikely All Star, as closers are typically the only relievers chosen for the game. 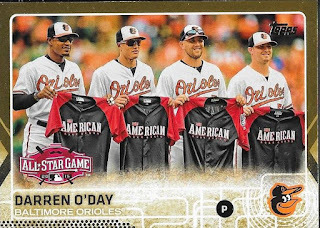 The fact that it shows all of the Oriole All Stars from 2015 is really cool, too. Finally, Tim included a card that I needed for the 2013 Topps Emerald set. I haven't been picking up any of these lately, so it was nice to be able to knock something off of my list. Thank you so much for the package, Tim! I hope to see you at this weekend's card show in Raleigh! 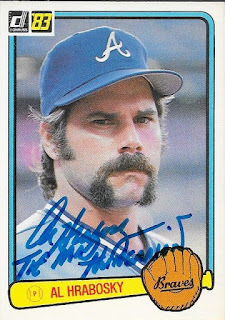 I received another TTM success recently when I got this 1983 Donruss signed by former Major Leaguer, Al Hrabosky. I sent to him on January 16, 2016 and got the card back on February 6, 2016. Not a bad turn around. I originally got the card in one of the many huge cards boxes that I picked up after Christmas from my good friend, and fellow blogger, Pete. This was the lone Hrabosky card in the box, and I figured I would try to see if I could get a TTM return out of it. I'm not disappointed! Hrabosky signed for free, and included the inscription "The Mad Hungarian". Pretty cool! Hrabosky (b. 1949) played in the majors from 1970 to 1982 for the Cardinals, Royals and Braves. Mainly a reliever, he compiled a career record of 64-36 with a 3.10 ERA and 97 saves. He finished as high as 3rd in the NL Cy Young voting (and 8th in the NL MVP voting) in 1975 when he went 13-3 with a 1.66 ERA. This is now, obviously a shift for me when it comes to TTMs. 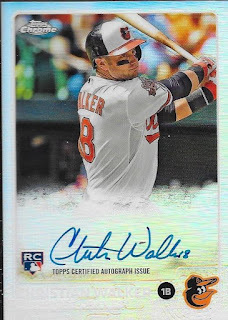 I had previously only sent off baseballs to be signed, but with the cost of OMLBs, the terrible fading of many of my past successes, and lack of space, I am now moving more toward having cards signed. I think this will help me get back some interest in TTMs. Well, football season is over and the NFL got what they wanted via tons of terrible calls and sent Peyton Manning off into the sunset with another ring and his 200th win. Good for him. I feel bad for my sister who is a huge Panther fan. I'm no football expert, but it did appear that there were a lot of missed calls that could have benefited the Panthers, and several calls against them that were questionable. Better luck next year, I guess. What all of this means, and with the receipt of my three jumbo boxes of 2016 Topps Series One, baseball is right around the corner! With that, I spent the majority of today by sorting through the cards and building my set. 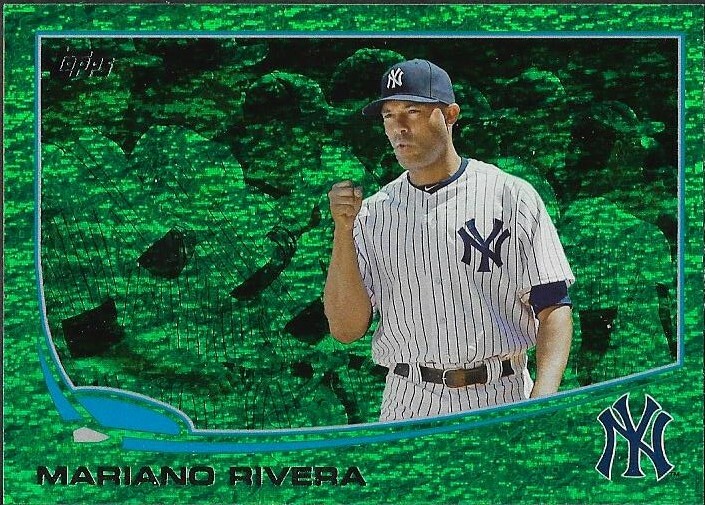 This year's design is probably one of Topps' best yet. From what I am hearing from a lot of my trading partners, lots of folks are really happy with the changes that were made. Gone it the standard white border seen on so many Topps offerings over the years. There are a ton of great photography shots this year, as has been customary in the recent past. I did ok with my hits from my boxes. I feel like I will be able to move all of them very quickly, which is something I haven't been able to say about hits from some of the past boxes I have bought. I also did pretty well with my own PC needs. As you can see at the start of this post, Chris Davis was in Series 1. 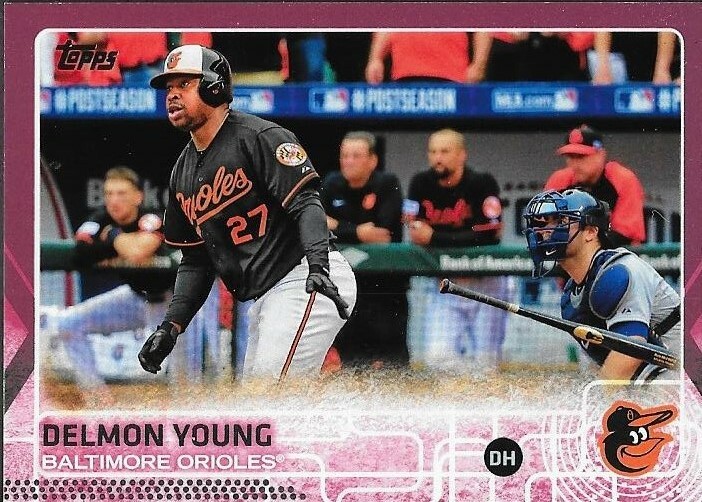 He also shows up in the AL Home Run Leaders and RBI Leaders cards. I have plenty of parallels to pursue as the year moves along. I finally was able to pull an actual PC parallel in one of my boxes, with the above Davis gold parallel. It is numbered 969/2016. I like how the color parallels are very subtle this year. I think it is a nice way to do them. They're subtle, but you can still tell what is a parallel and what isn't. Another cool parallel that I was happy to see return is the Topps retro parallel. With the Topps retro logo and an old-school card stock, these are pretty nice cards. I pulled this Sonny Gray numbered 81/99. Another cool parallel not shown on this post was the black and white negative parallel. This aren't numbered, but are seeded one in every 22 jumbo packs. I pulled two of them (Curtis Granderson and Dee Gordon) and already have one sold. The only drawback from the black and white parallel, is that they look too similar to a printing plate and I'm sure there will be some initial confusion when folks pull them. Finally, I didn't feel bogged down by a ton of inserts. There are several insert sets, but I won't be pursuing them. I did pull two of these Ripken/Murray Back to Back inserts, so there are two new additions to those PCs. Not bad. Overall, I was really happy with this year's Series 1. While I didn't have any super pulls, this one was solid, and being able to move almost everything quickly helps me out. I will be able to move the rest at next weekend's card show. Come on out to see me if you can make it! A Belated Post About a Belated Package From Michael A.
I have had this package from Michael A. from Instagram and Facebook since before Christmas, I think. He didn't put a note in the package, and at one point it was at the bottom of my "to be blogged" pile, but the pile was accidentally knocked over a couple weeks ago. I was able to keep everything together, but I realized that I had forgotten who these cards came from. I embarrassingly posted them on Instagram and asked who had sent them to me, and Michael responded within seconds. I remembered the Daniel Cabrera auto, but hadn't been sure who sent it, obviously, but since Michael said it was him, I remember now when we talked about it. Cabrera was one of those pitchers who could (and did) get a pitching coach fired. He had such good stuff, when he could trust and command it, but that consistent trust and command eluded him throughout his career. 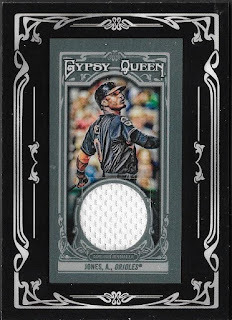 Another nice card he sent was this Adam Jones framed relic from 2013 Gypsy Queen. I'm pretty sure I have one of these already, but I will gladly take others. I like the look of the framed relics and autos from Ginter and GQ. Thanks for the package, Michael. I'm sorry it took me so long to post it, and I'm equally as sorry that I forgot who sent it. Please include a note, next time! Recently, I won my first contest on Instagram. 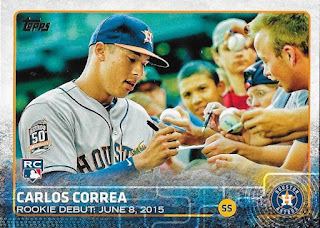 Topps' Instagram account was giving away three boxes of 2015 Strata to folks that other Instagram users nominated. A lot of my Instagram friends nominated me, and I ended up being one of the names that was drawn. I had never won a contest like that before, and I was so very flattered that it came by way of others feeling like I deserved something nice. The box itself was ok, I got a nice Rick Porcello relic/auto and a Yan Gomes auto. The setup is one pack per box, two cards per pack. So, I can't be all that disappointed, since I didn't pay for the box. I can sell the cards I pulled at my next show, and just pick up a couple Strata here and there to make up for the ones the I sell. I was really disappointed that Chris Davis wasn't on the checklist for Strata, otherwise I would be buying a bunch of his cards from there. 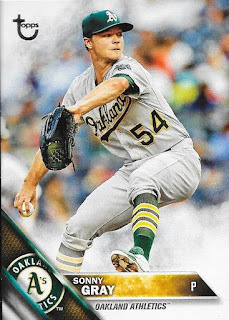 Instead, I went toward another PC player, Sonny Gray. I got the same kind of card that the Porcello is, and am really happy with what I got. This card is not numbered, but that doesn't matter to me. The signature is on card, and the piece of jersey came from a game that Gray pitched (May 8, 2015). 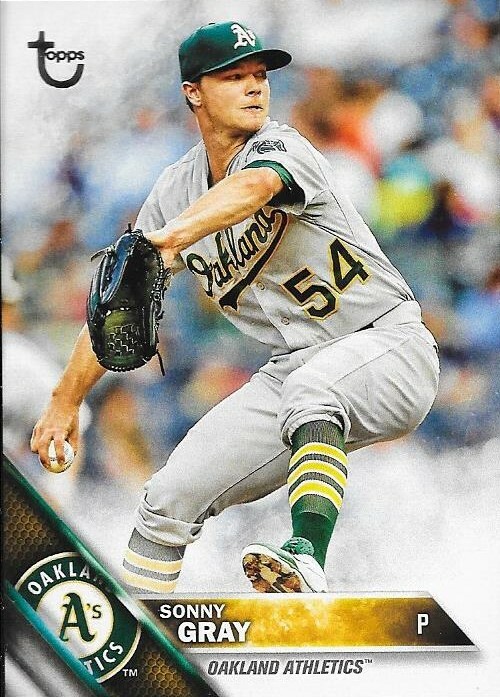 He struck out 9 in 6 innings, but the A's would go on to lose due to a walkoff in extras. I really like the Strata product, but am very disappointed that the cards don't really hold a lot of value. 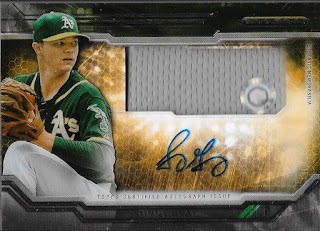 Sure, I was happy to be able to get this Sonny Gray for my collection at only $10, but with 2 cards per ~$75 box, you would think the individual cards themselves would carry a much higher price-point. I don't blame the actual cards themselves, because they are very high quality. However, I think the checklist might be to blame. I think that is the case all around the hobby when it comes to relics and autos, though. I mean, Porcello, con't get me wrong, but I think bigger names should be what is in stuff like this, especially if folks are expected to pay $75 for a pack. I guess I would have felt a little differently had I pulled a Bryce Harper, Manny Machado or Kris Bryant. 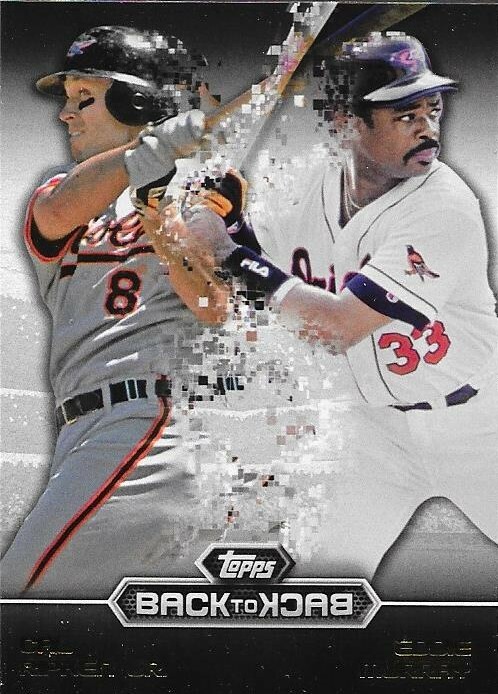 Cal and Manny are the only Orioles I have seen in the product. Oh well, I'm happy with this Gray, and I am sure someone will be happy with the Porcello. I know the person getting the Gomes will be happy, since it is going to a friend of mine. My good friend, Sam, told me that he was still working on another part of a Christmas gift for me when he sent the first bit of it back in December. He even told me what he was working on; he was sending an 8x10 to Nolan Reimold TTM to try to get it signed and inscribed to me for Christmas. Funny thing was, when I was at Fan Fest, I got Nolan to sign a ball for Sam, inscribed "To Sam, Merry Christmas", without knowing that Sam was working on this TTM. The package with the signed photo came today. I was still amazed by Sam's generosity, even though he told me a month ago that this was coming. The photo looks great, and I will get it framed this weekend. Sam, wasn't done, however. He said he had picked up a surprise and would include it with the Nolan photo. When the Nolan got here today, it was in a page protector and some cars stock that served as protection. I had shown my wife the Nolan photo, and as I was taking it out of the protector, I told her "You know, Sam said he was sending something else, I wonder if he forgot to put it in the package." Then, as I got the photo out of the page protector, I noticed there was another photo behind it. This awesome black and white 8x10 signed by friend of this blog, Mr. Virgil Trucks. I had tears in my eyes as I studied this photo that I had never seen of him before. Clearly taken in Spring Training of 1958, this was something I definitely wasn't expecting from Sam. I once was really hard on Sam. He had asked me to find a bunch of cards for him, which I did. I spent hours of several days going through boxes of cards, pulling out guys he said he was looking for. He would message me as I was halfway through and ask for additional guys. I had to stop a coupld times and go through the same boxes again and again. Finally, I had him a stack of cards, then when he said he wanted them all, I named a modest price. He balked, and walked away from the deal. I was upset and didn't talk to him for a while after that. Sam, would message me a few months later, asking if I had cards of a certain player, to which I jumped on him because he made me go through those boxes of cards for hours, just for him to kill the deal. I overreacted, and was rude to a kid. That was something I swore I wouldn't do. He apologized, and I apologized. I felt terrible that I jumped all over this kid, all about some cards. Since then, Sam and I have become really good friends. I have helped him grow his collection. I made him a really cool photo book from Shutterfly that he could use for his trips to Spring Training. He keeps telling me that my blowing up on him wasn't a big deal, but I still regret it to this day. He has been very generous over the last couple of years that we have been friends, and now he goes above and beyond to get me something he thought I would enjoy for Christmas. Sam is a really good guy, and I am happy to call him my friend. Thank you so much for working so hard on getting these photos for me. I appreciate it, and I will love having them hanging on my wall. Thank you, little buddy. You're a great guy! My friend Tim from the blog "I Love The Smell of Cardboard in the Morning" emailed me recently about a package he intended to ship to me. In his closing remarks in the email, he mentioned that a fellow blogger had pulled an amazing Manny Machado dual relic/auto and was looking to unload it. I took a look at the card and was amazed by it, but shot myself down pretty quickly. My thoughts were "this card is awesome, but there is no way I will be able to afford to pry it away from him..." Fast forward a couple weeks and I get a surprise follow on Instagram and then an email from the proprietor of the owner of the card, fellow blogger Jared from the blog Catching Up With Collecting. Jared had heard that I was an Orioles fan and would be interested in the card, so I asked him what it would take to pry it away. Then, I remembered that I was going to be heading to the antique shop in Columbia and could possibly find some cards that were on his top ten want list. So, after my trip, I had a couple cards I thought Jared would like, and we instantly matched up on a deal. You can read about what he got in the trade here. 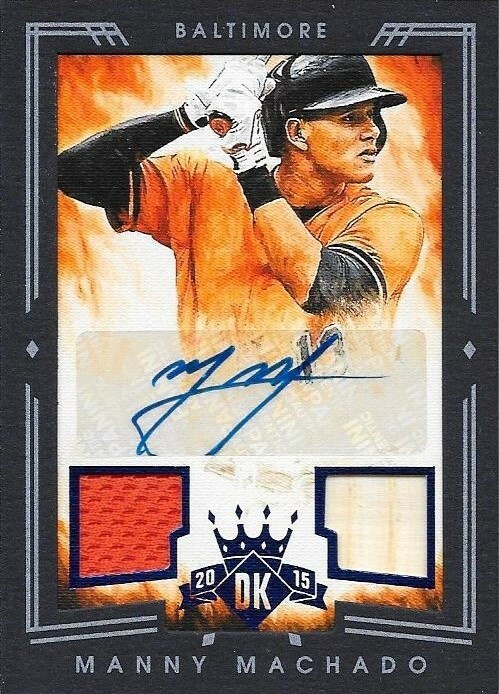 This Machado card is really awesome, and I am happy that I was able to pull off a trade to get it. It is numbered 8/10 and will go in a magnetic case, once I go to the card show in the middle of this month. Thank you for the deal, Jared! I hope you are as happy with your end of the deal as I am with mine! Christmas Gift From Jacob R.
I got a nice little Christmas care package from my buddy, Jacob R. for Christmas. 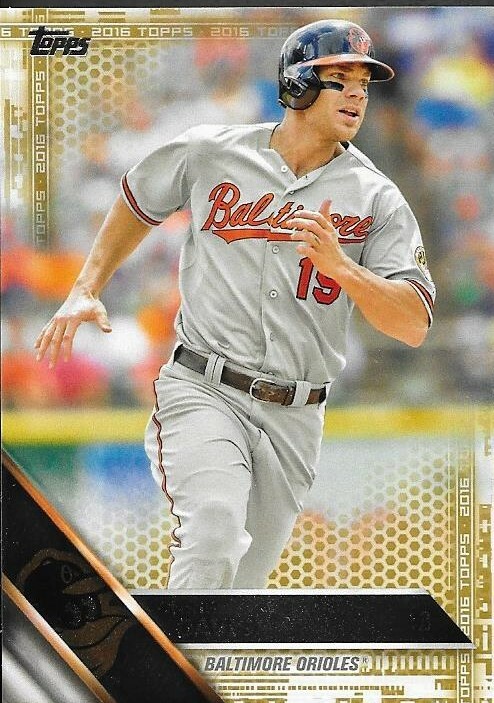 Inside the package was a 2010 Topps Jake Arrieta RC, a 2015 Topps Rey Navarro RC and the above IP auto of former Oriole Mark Reynolds. It was really nice of Jacob to think of me. For Christmas, I sent him a stack of PC stuff of some of his favorite players and also some Expos cards. He is a young guy who likes Expos, which is something you don't see a lot of. That's pretty cool! Thanks for the care package, Jacob! 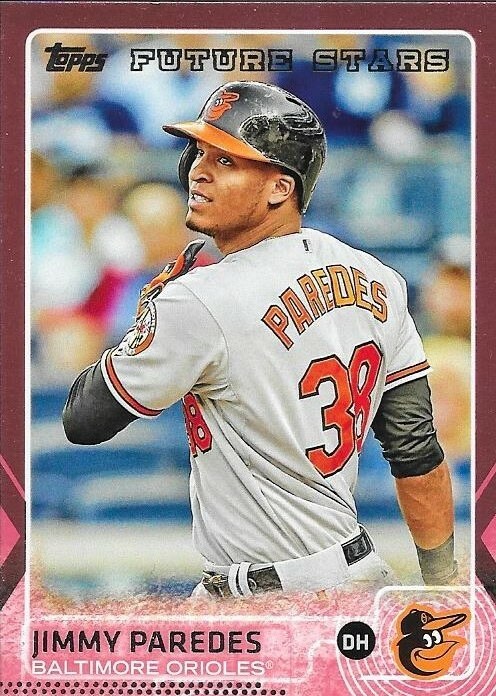 My friend Anthony, from Instagram, surprised me with a package a few weeks ago that had this 2015 Topps Jimmy Paredes pink parallel inside it. The card is numbered 41/50 and was one that I didn't have in my collection. 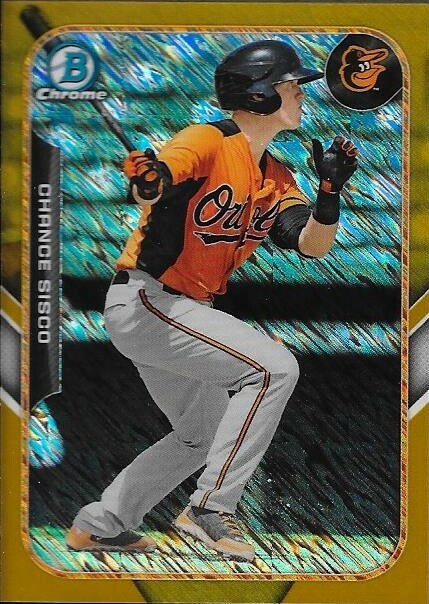 I have two of his parallels now, this one, and the Topps Update sparkle chrome. I said before that Paredes was really fun to watch at the beginning of last season, but once the league caught up to him, he was pretty dreadful. 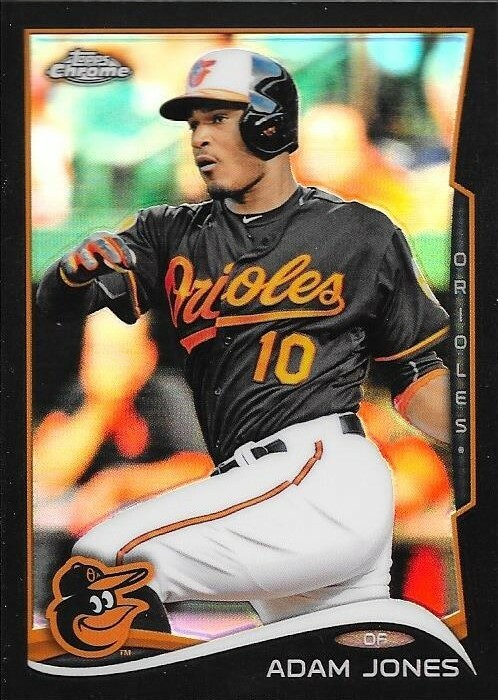 I'm hoping he can establish himself and become an everyday player for the Orioles. I'll be hoarding these cards until then. Thanks for the package, Anthony!